There's a famous quote by Roger Ebert about movies, which is "it's not what a movie is about, it's how it is about it." Since pretty much any kind of story you can tell has been told, what matters is the execution - the interesting twist, the craft involved. I think of this because there are few stories that have been told more frequently in science fiction than time travel stories, so if you're going to tell one, hopefully you bring something interesting to the table. Thankfully, in the case of EI8HT, if you are as gifted a visual storyteller as Rafael Albuquerque, you bring a lot to the table. Few artists I've seen do a better job than Rafael Albuquerque in creating a real sense of threat, a legitimate sense that a character on the page is truly scary. In American Vampire (written by Scott Snyder), Albuquerque accomplished something almost impossible for me (and I think for many others); he made vampires seem both scary and interesting again. 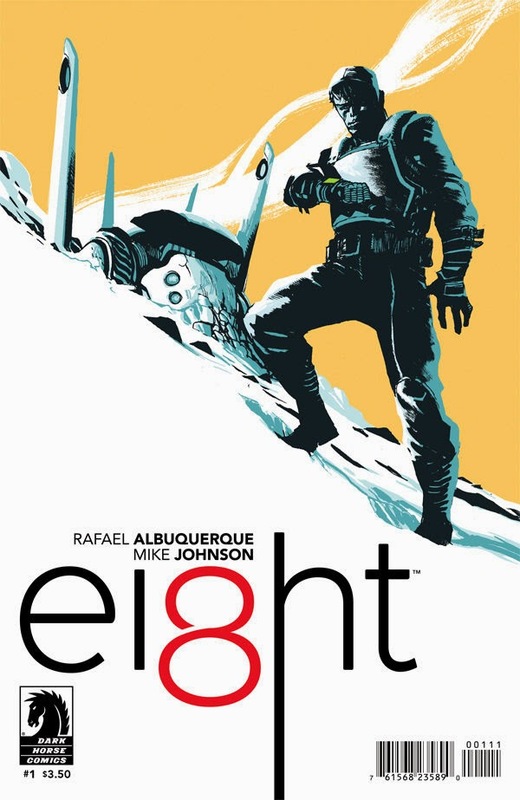 In EI8HT, he does something similarly great (at least for a first issue); along with co-writer Mike Johnson, Albuquerque makes time travel stories feel new and weird and interesting. EI8HT is a story of a man sent traveling through time and space. His name is Joshua; he's doing something important for the people in charge (and in possession of time travel technology), in order that they do something very important for him. The story goes back and forth between the present (which is the future) and the past, and maybe some place even weirder. Joshua has a clear mission, but as the first issue ends, it's certain this is going to be a harrowing journey and he'll have plenty of obstacles in his way. This is great, engaging comics. It's weird, exciting, mysterious, and the reader gets thrown right into the middle of the story (we're in the same position as Joshua, wondering confusedly what the hell is going on). This feels like a story that's both personal (desperate man willing to undergo dangerous mission in exchange for something incredibly important to him) and epic (action-packed science fiction story about a man sent across time in order to address some enormous threat, landing in a strange, exotic world). Like many good time travel stories, it's not even really about time travel. The time travel is a vehicle to set the scene; this is really a story about a stranger in a strange land, and the question of whether he will overcome all of the weird obstacles in his way in order to accomplish his mission. It's a story about desperation, that also happens to involve post-apocalyptic warriors and little dinosaurs (oh yeah, there are dinosaurs). 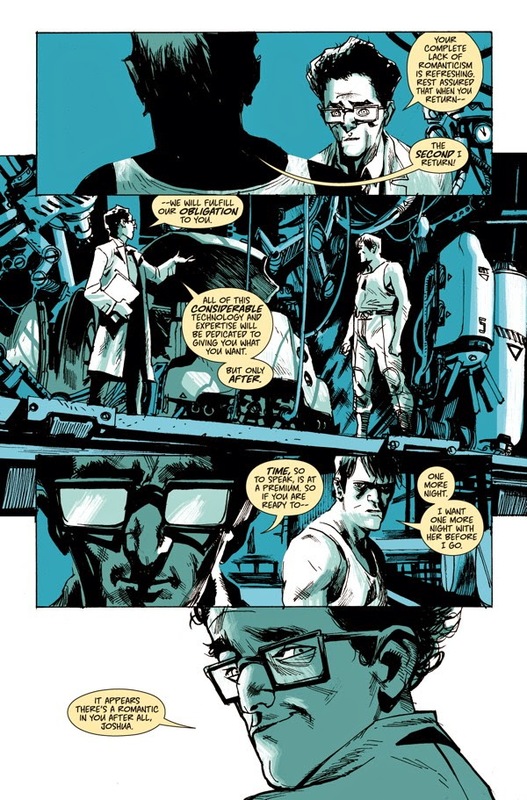 The sequential storytelling here is excellent (no surprise to any American Vampire reader). In addition to his skill as a colorist, Albuquerque excels at both visual storytelling on a macro level, along with the small details that make a comic page interesting. There's a lot going on in this story, but the creative team provides a little bit of a lifeline to the reader, through the usage of color. The color scheme here is pretty striking. 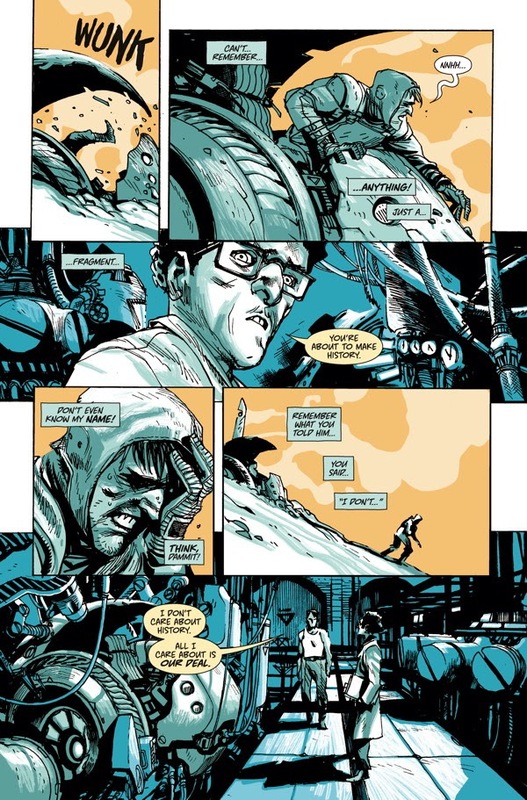 Albuquerque uses a sparse, limited color palate to illustrate the book, and the creative team informs the reader on the first page that the different colors signify different time periods. * So the relatively monochromatic color schemes serve both an aesthetic and an explicit narrative purpose. The colors themselves are quite striking, as the backgrounds are often just solid, flat colored empty spaces. However, rather than feeling rushed or unfinished, this feels like a very deliberate choice to create a sense of loneliness, of coldness and desolation that works perfectly to encapsulate both the desperation of the main character, and the strange alien world in which he eventually finds himself. For the most part, people are illustrated using grays, except for the occasional face paint or bloody bandage (which feels all the more striking given the limited color scheme). The people themselves are somewhat stylized and angular, which is consistent with Albuquerque's work in other series; what's interesting is that here he takes his character design a little further in depicting a more epic science fiction world than he usually illustrates. A few of his characters have big, almost manga-like eyes, among other exaggerated design traits. It feels like he's generally exploring some different artistic techniques here, and it's fun to see. It also all works quite well for the story being told. The thoughtfulness in the book extends to the lettering, ably done by Nate Piekos. Word balloons that are illustrated as flashback are colored differently than those in the present, a thoughtful touch. Piekos additionally provides some nice sound effects lettering throughout the story that illustrate tense moments and big action. This is a strong, engaging, weird start to a series. For fans of Rafael Albuquerque's work, and of science fiction and time travel mystery stories generally, this is definite pickup. * When I read a comic like this is one of the few times I wish I wasn't color blind. Though it adds an additional element of mystery to comics review.